Fertilisers are concentrated sources of plant nutrients, usually in compact form such as pellets, granules, powders or liquids. They are used to improve plant growth and yields. Fertilisers are used to improve plant growth. The faster growing the plant, the more it will benefit from fertiliser application. If you have a healthy soil, it is often not necessary to use fertilisers, but using them may produce a showier display of blooms or a higher yield of produce from edible crops. Fertilisers are also used where plants are showing signs of nutrient deficiency, usually shown by leaf yellowing or discolouration in varying patterns for different nutrients. Remember that healthy soil structure and pH are just as important as fertiliser application in the prevention of plant nutrient deficiencies. Soil conditioners such as manure and compost help the soil to form into crumbs with spaces for air and water between them, making nutrients, water and air all more available to plant roots. Lime is added to remedy acidity. Fertilisers contain concentrated sources of plant nutrients in chemical or organic form. Most contain major plant nutrients, which plants need in relatively large amounts. Some also contain trace elements, which plants only need in tiny amounts. All fertilisers should quote their N:P:K ratio on the product packaging. For example, a ratio of 20:20:20 indicates a balanced fertiliser (in this instance Chempak formula 3), but a ratio of 10:12:24 would indicate a high potassium fertiliser (in this case Chempak Rose Food). However the N:P:K can be misleading if they refer to phosphates and potash, rather than phosphorus and potassium, see our advice in fertiliser labels explained for more information. There are two main types of fertilisers: inorganic (man-made) and organic (derived from plant or animal). Organic fertilisers: These are derived from plant or animal sources and contain plant nutrients in organic form. Organic products tend to be slower acting, as large organic molecules have to be broken down by soil organisms before the nutrients within them are released for plant use. Examples of organic fertilisers include: seaweed, hoof & horn, dried blood, fish blood & bone, bone meal, poultry manure pellets and liquid comfrey or nettle feeds. Compound fertilisers: These contain a mixture of different nutrients, and may be balanced (containing similar proportions of all the major plant nutrients) or may supply more of some nutrients than others, as per the requirements of different crops. They may be organic or inorganic, or contain both. Straight fertilisers: These contain only one or mainly one nutrient. They are usually used to provide different nutrients at different times of the year, or to correct particular nutrient deficiencies. They are usually inorganic. Controlled release fertilisers: These are almost always granules of inorganic fertilisers coated with a porous material such as sulphur or synthetic resin. Water enters the granule and the fertilisers leach out into the surrounding soil. The warmer the soil, the faster the leaching; this corresponds to plant growth which is faster in warm weather. By varying the thickness of the coating granules can be designed to feed plants for different periods of time. Slow release fertilisers: These degrade slowly, usually under the influence of soil micro-organisms to release their nutrients and again are dependant on soil temperature. These are usually organic and include hoof & horn and bone meal. There are many ways to apply fertilisers, and the method you choose will greatly depend on the product you are using. Here are some of the most common methods of application, along with examples of when you would use this method. 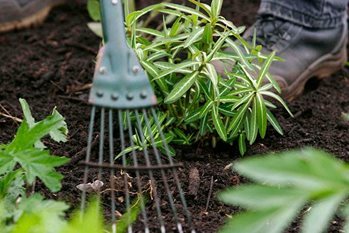 Top dressing: This is the application of quick-acting fertilisers to the soil surface around plants to stimulate growth, and is usually carried out in spring at the start of the growing season. Take care to avoid leaf contact, which can cause scorching, and to protect against over application, which could cause root damage and pollution of ground water. Base dressing: This is the incorporation of fertiliser into the soil or potting compost before sowing or planting. Watering on: Liquid fertilisers or soluble powders and granules can be dissolved or diluted and watered onto plant roots during the growing season to give them an instant boost. They are mainly used for feeding glasshouse crops, pot plants and bedding. The nutrients in liquid fertilisers are instantly available. Care must be taken to avoid leaf contact, which can cause scorching. Foliar feeding: This is the application of a dilute solution of fertiliser to the leaves of plants, useful as an emergency treatment for correcting nutrient deficiencies or for providing quick supplementary feeding. The absorption of liquid fertiliser is greatest where leaf surfaces are tender, particularly on the under surfaces of leaves or on young leaves that are just expanding. Foliar feeds should not be applied in bright sunlight because the foliage may be scorched.